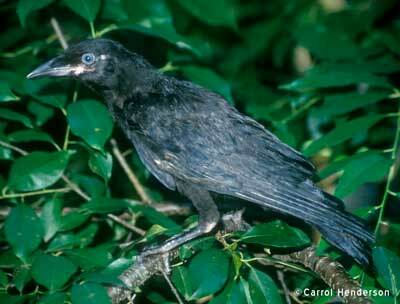 The American crow is a large, completely black, slightly iridescent bird commonly found throughout the State of Minnesota. They are omnivores and will eat nearly anything. They participate in flocking behavior, with large flocks gathering in winter feeding and roosting areas. Communal roosting occurs from autumn through mid-winter, and typically occurs in areas with large trees. This behavior, along with their opportunistic feeding habits, can cause this species to come in conflict with human activities. If you are having a problem with crows, use the links in the left navigation for specific information on American crow damage management. You can also get information and sources for bird control materials, from your local DNR Area Wildlife Manager.